If you had read the Meteorological Office's summary of observations for February 1891, you could hardly be blamed for assuming that spring would be sunny and delightful. The weather in February had been exceptionally dry, although there was a more than usual amount of fog, particularly towards the latter part of the month. There was surprisingly little rain; according to the Met, less than one-tenth of an inch over the whole of England. There was, however, enough bright sunshine to suggest that fine weather was on its way. The amount of bright sunshine was upon the whole very large, especially over England where the per-centage of the possible quantity was in some places nearly twice as much as the average. March, however, was to prove a different matter. The first few days of the month were chilly, with none of the badly needed rain which farmers must have hoped would follow such a temperate February. During the first week of the new month, the weather turned colder but, on the whole, remained fair. In fact, the forecast for Southwest England and Wales, for 9 March, issued at 8:30 the previous evening, called for "North-easterly winds, moderate; fair generally." in the three towns some four or five inches of snow lay upon the ground, and the wind had increased to a hurricane. Slates began to start from the roofs of houses, and chimneys to fall, and in a very short time the streets assumed a deserted appearance, and all vehicular traffic was stopped. Advertisement hoardings were hurled from their positions with some terrible crashes. Tuesday was "an indescribably wretched day," while Thursday saw more snow and squalls. In Bristol, in the early hours of the storm, tramway cars were unable to function and had to be withdrawn from service. On at least one line an attempt was made to keep it functioning using five horses instead of the usual two. Even with the additional pulling power, the results were unsatisfactory. At Tiverton, the weather on market day was so severe that the event was suspended for the first time in its history. One of the most awful nights ever known here is being experienced in the Channel tonight. The gale of this afternoon has increased into a hurricane, accompanied by a blizzard. The sea in the harbour is so rough that the waves are washing over the quays, and great excitement prevails, the greatest difficulty being experienced in holding the vessels to their moorings. But the Met remained phlegmatic. Their forecast for the 10th, issued at 8:30 pm on the previous day, merely suggested that in the South-west and in South Wales there would be "wind backing northwards and moderating; very cold, some snow." Despite the forecast from the Met, on Monday the 9th, the South of England was devastated by a storm of such magnitude as had not been witnessed in living memory. The storm continued unabated for days. According to the National Maritime Museum in Cornwall, Devon and Cornwall were practically isolated by the storm in which 200 people died. Trees were uprooted, trains were snowbound and snow piled in drifts up to 15 feet high. One train was only discovered after 36 hours when a farmer looking for lost sheep was hailed by the passengers. All that time it had been only 250 yards from the farmhouse! The train line between Newton Abbott and Plymouth was completely blocked, but the full extent of the situation was unknown since telegraph lines had come down as a result of the storm. 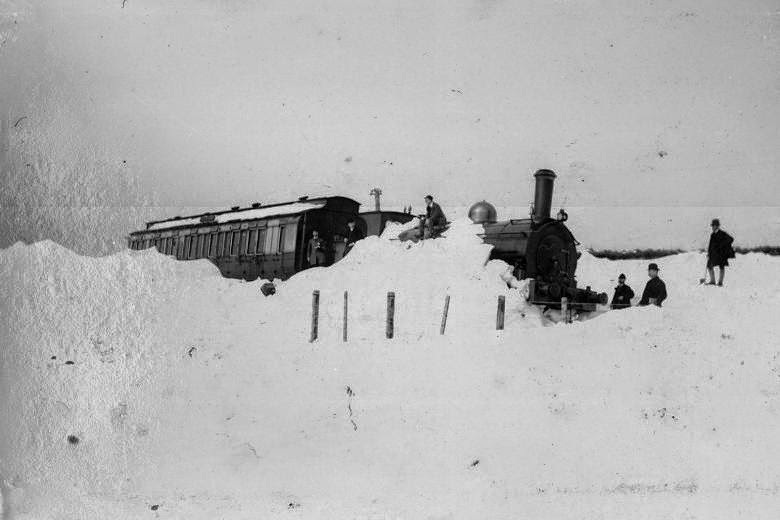 Between Bridestow and Okehampton a passenger train with more than 100 on board was snowed in for twenty hours. If those on trains were inconvenienced and uncomfortable those aboard ships were faced with fearful conditions. All along the Channel and beyond, ships were blown aground. 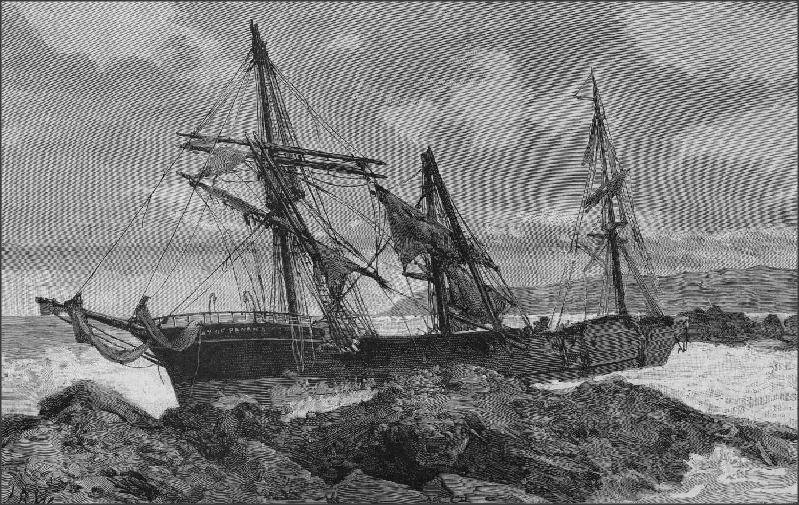 Perhaps the most dramatic was the wreck of the Bay of Panama making for Dundee with a load of Jute taken on at Calcutta. She was 111 days out when she was driven onto the rocks at Penare Point about 25 miles south of Falmouth. A four masted steel ship, she was eight years old and a beautiful vessel, but in the worst storm to hit the Southwest in well over a century, she proved no match for the weather. The captain, DavidWright, of Liverpool, his wife, all but one of the six officers, four apprentices, and six of the crew, were either frozen to death in the rigging or drowned.This made a loss of eighteen lives out of a company of about forty all told. While it was the most dramatic wreck of the storm, it was only one of many. From Falmouth the news was telegraphed to The Times of a number of other wrecks. A steamer went ashore at Portloe with the loss of one life. Nearby, a German steamer was driven ashore. Even those ships that managed to survive the storm often did so with loss of life and extensive damage. The survivors, numbering seven, of the steamer Neptune, of Newcastle, on being landed at Weymouth ... reported the loss of their captain and first mate ... washed overboard. ... The steamer left Guernsey on Monday, and, after being at sea a few hours, met the full force of the blizzard in the English Channel. Sea after sea swept her decks, partially dismantling her. The fires were extinguished, and, when the vessel was on the point of foundering, the steamer Headworth fell in with her, and towed her to Portland. Other crews were luckier and despite considerable risk and difficulties managed to survive the storm. The schooner Alice Brookall, with a cargo of coals from Swansea to Jersey ran aground; the crew of five dropped from the bowsprit to the rocks where they passed the night "exposed to the fury of the storm." In the morning the climbed the cliffs and reached a farmhouse where they were able to shelter. In the south-east and south-west districts of London employment in abundance for slaters, carpenters, glaziers, and gardeners, and even brick-layers, will be one result of the storm. Roofs have been partially stripped of slates and tiles, the framework and glass of conservatories injured beyond repair, and flower-beds and shrubberies destroyed, even gate-pillars being dismantled and small boundary brick walls thrown down. Some fine trees in Dulwich have been uprooted, and in Brixton the windows in some private houses have been blown in. Among the greatest risks for those on land as well as those on sea was that of fire. The cold weather meant that many households had recourse to the fireplace for heat, but the high winds placed chimneys at risk and even when the chimney survived, the wind blew smoke and snow back down into the fireplace. 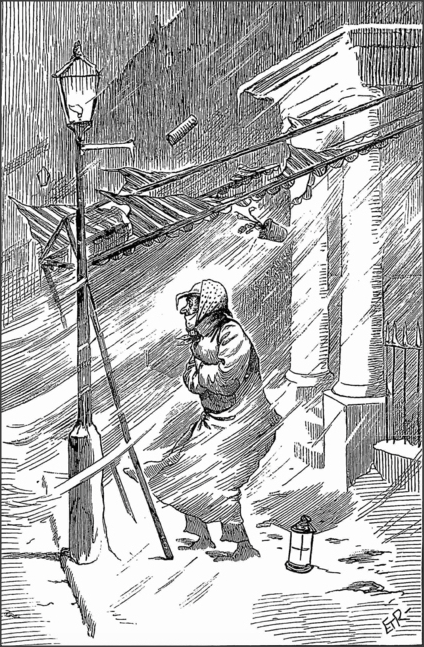 Despite the terrible effects of the storm, Mr Punch could not resist a poke at the traditional afternoon "At Home," suggesting that even that had been suspended due to the weather! In all, the week beginning March 9th was a memorable one. The storm which lasted for several days finally departed, almost at its leisure leaving a trail of death and destruction in its wake. For many, particularly those living in the Southwest of England, it would be the worst storm in their lifetime. In the ferocious blizzard, more than 200 people and 6,000 animals died. Twenty-eight ships were sunk and the cost to shipping, businesses and individuals was incalculable. To download or read on-line an 1891 account of The Blizzard in the West, click here.